To be honest, I’ve heard very little of Cambodian cooking before picking up a copy of the award-winning From spiders to Water Lillies – Creative Cambodian Cooking with Friends at the Good Food and Wine Show recently. Aside from being able to recall a few stories told by my grammar and vocabulary teacher in highschool who spent a few years in Laos and Cambodia teaching underprivileged kids English, I still know very little about this part of the world. So when I first came across this wonderful Cambodian cookbook, I was intrigued to say the least. The great thing about this (cook)book is that apart from gorgeous recipes – including one for crispy fried tarantulas!, it tells a story of the people, their culture and daily struggles of living on the streets in poverty beyond our imagination. The even greater thing about the book is that it has been published by Friends-International, a charity which began working in underprivileged areas of Laos and Cambodia with those same street kids, providing them with basic education and skills in professions that may help them find a better future. Today Friends International has projects including tourist friendly restuarants run entirely by former street kids in Cambodia, Laos PDR, Thailand, Indonesia, Myanmar and Honduras, and is expanding to other countries in Asia and South America. 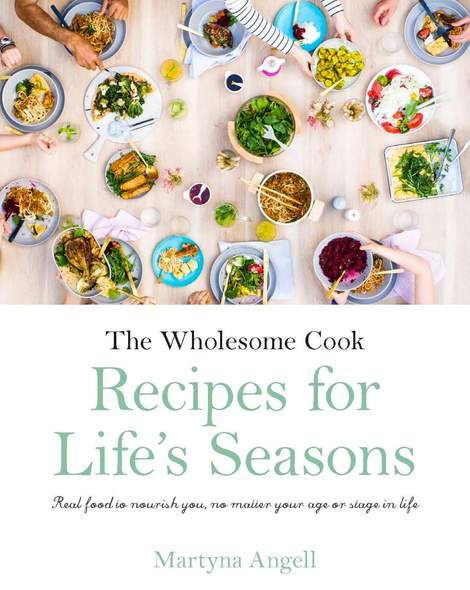 If you are passionate about good, honest food and care about the welfare of the less fortunate in this world, I encourage you to pick up a copy of this lovely easy to use – even in the Western world, cookbook. Proceeds of From Spiders to Water Lilies go directly back to Friends-International projects. This beautifully illustrated book introduces us to a world of new and exotic flavours, not commonly found in Western cuisine but I find that many of the ingredients such as kaffir lime leaves, green mangoes or lotus root, are just as easily accessible, especially here in Australia. It also gives an overview and recipes for essential pastes and sauces, which again can be easily rustled up in a modern, Western kitchen. Some of the recipes I will definitely be trying include a fish, pumpkin and coconut curry; grilled eggplant topped with pork and coriander; and lotus root and chicken salad with galangal dressing. 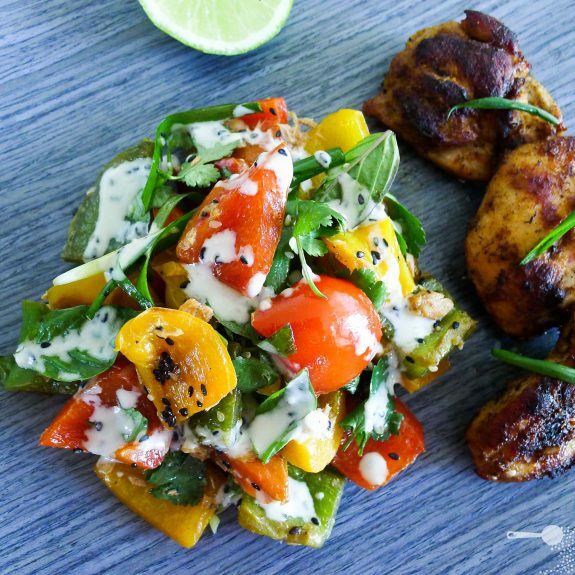 For now, and to prove how accessible the recipes really are, I have tried this gorgeous grilled capsicum salad with sesame dressing. It’s as good as it sounds. I’ll leave the tarantula recipe for another day. RRP$45 (plus delivery). Available from www.cambodiancooking.com.au or good bookstores such as Berkelouw, Readings, Gleebooks and Oxfam Australia-wide. Original recipe from From Spiders to Water Lillies. Serve alongside grilled red curry chicken or fish. For a vegetarian version you can omit the smoked fish (incidentally, I didn’t have any so just used some flaked canned tuna) and fish sauce, perhaps use soy sauce for saltiness instead. To make the salad: remove seeds from capsicums and slice flesh into 2cm squares. Marinade capsicum in oil, pepper and salt for 20 minutes. Grill capsicum squares or stir fry in a wok on medium heat for about 5-7 minutes on both sides until softened, set aside to cool. You eat the skin in this dish, so don’t burn it. But, if you prefer not to eat the skins, grill capsicum until the skin is blackened. Transfer to a bowl and cover with plastic wrap to soften and leave for a few minutes. Peel the skins off. To make the dressing: mix all dressing ingredients in a bowl and allow to infuse for a few minutes. To serve: place capsicum squares in a bowl, add half the shallots, torn basil and coriander, smoked fish and sesame seeds. Pour iover dressing and mix gently. Divide between 4 serving plates and top with extra shallots and sesame seeds. this is perfect for this weather. marty, yummy! Thanks Laura, it is VERY good and VERY easy to make, plus filled vith vitamin C goodness! This book looks great, Martyna!! Thanks for the link. I know little about Cambodian cuisine, I’ve never been there. This recipe looks delicious! Thanks Heidi – according to the website Cambodian cooking takes on many flavours from its neighbours but many of the recipes are unique to the country, and its people are very proud of their cuisine. How exquisite is this?? It looks beautiful – fresh and colorful. I love plating things with some oomph! Wow, that is so pretty and tasty looking. I just suddenly became interested in Cambodian cooking. I thoroughly recommend getting the book then both for the lovely recipes and the human value it carries. Oh wow, Lucy, that is so great! Even though I have no authority to do so, I want to say a big thanks to you for supporting this wonderful idea in so many ways! Yum I love the flavours in this! Sounds so delicious! Thanks Maria, it was! I was secretly hoping Mr Chipconnoisseur would take the other night’s dinner leftovers for lunch so that I could have this for myself, but he immediately opted for the salad even though he had the choice of tacos, his ultimate favourite! The dressing really caught my eye – love the thought of it mixed with the saltiness and freshness of the salad. As ridiculous as it sounds (to us) I am wondering what tarantula would taste like … I think it’s the ‘crispy fried’ bit that’s piqued my interest! I also know very little about Laos and Cambodia food/cooking. Thanks for this post. this salad looks really colourful and delicious. I was in Cambodia last year and did a great cooking course, recipes at http://wp.me/pYWFU-5b and http://wp.me/pYWFU-4Z. And the good people behind this book have a great restaurant in Phnom Penh called Romdeng. I couldn’t eat the tarantula, but everything else was very good indeed. looks amazing, my mum has been to cambodia and has a real heart for the poeple. i am going to buy this book – not sure if to cook her something from it, or to give to her….